Main tank and pumping system. 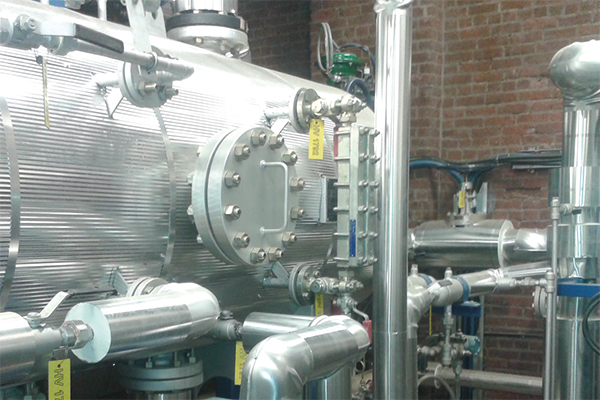 Major work was carried out at the Mechanicville Tissue Group plant last fall, where Cascades’ very first steam generator was installed. 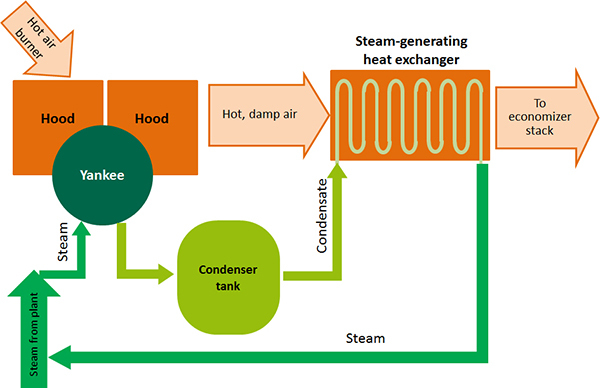 The system is composed mainly of a heat exchanger that uses energy from hot exhaust from the paper machine’s hood to produce steam. A simplified diagram of the process is presented below. The exchanger is at the heart of a condensate pumping network, which consists of vapour-liquid separators, hot gas dampers and an automated control system for optimal, independent and safe production. We expect the system to result in natural gas savings of 4.2 GJ/h on average. This type of energy recovery is optimal for producing high-quality energy. In terms of energy, the pressurized steam produced is of better quality than air preheated at lower temperatures. The system, in operation since January 2015, produces between 3500 and 4500 lb/h of steam, depending on the supply from the Yankee hood. Some modifications and adjustments are being made to optimize the system and render it fully operational. Since this is a first at Cascades, the risk of complications and underperformance is high. Plant Manager Philippe Bourassa and the employees at the Mechanicville plant agreed to take on the challenge, which is already paying off in regard to energy efficiency and a reduction in natural gas consumption. The project is being assessed for future implementation at other Cascades Tissue Group plants.